"Running the NYC marathon ? The Course, Weather, Experience and of Course, the Training Tools." The ING New York City Marathon has lately taken the seat as the main marathon in the world, together with London, Chicago and Berlin marathon. Here are info-scoops on the NYC marathon program - the schedule, course, registration, weather (can be hot and humid) photos, video (they have excellent services for that). and the general New York tourism experience. The best New York Marathon Training to prepare yourself for the big day. What elements to have in the best marathon training schedule for the "Big Apple Marathon", a plan - a practical guide to go by. Click here to share a review, of your favorite New York Marathon tips, with visitors to this page! New York City Marathon, From a Small Start To a World Class Event. "For a big city, New York's marathon had a humble enough beginning"
It's not even the oldest in America (that prize goes to the Boston marathon), but it is certainly the biggest, with over 100,000 runners apply to be in the most recent race. 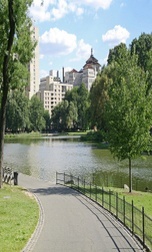 The run got its start back in 1970, when little more than a hundred athletes raced around and around Central Park in order to log the required twenty-six mile distance. They each only paid a dollar to be in it, and only fifty-five crossed the finish line..
Well, today, things are quite different. Plus 9 time winner Grete Waitz as one of the forerunners of the many charities and foundations that has been focused on in the marathon lately. In addition to that, you of course have the top runners racing for the big prize money awards with the Kenyan stars in the front-chase for a total prize money award of a whopping 600.000 USD in prize money for the winners and top finishers. If you want to run the New York Marathon, you cannot find a more special route. The course starts on Staten Island right at the Verazano-Narrows Bridge, and then snakes through all the boroughs of the city; passed Dyker Heights and Sunset Park in Brooklyn; through Prospect Heights, Boerum Hill and Clinton Hill, and then through the two Williamsburgs. After that, a quick swing through Queens, and over the Queensboro Bridge onto Manhattan. While the end is in Central Park, the route loops up through the Bronx, and then down through Harlem in order to get the required distance. To be honest, some people were less than enthusiastic about the new course. There were concerns about traffic jams (always an issue in the city), and public safety. After all, how would it look on the world news if marathon runners were shown being mugged on the streets of Queens or the Bronx? As it turned out, the new route was a sensation. The first year of the new course - 1976 - just over two thousand people entered the race. Also, the presence of television, radio, and the crowds on the streets cheering the runner on served to boost interest in the race. Two years later, over nine thousand people were running in it. Of course, when you consider the location, and the time of year, it is easy to see the attraction of the race. Want to see the course mile by mile ? Check out the New York City Marathon course video right above. Is New York Marathon a Marathon For You ? Considering New York for your next marathon ? The fantastic course experience. New York City Center throughout. Extremely well organized marathon. From start till the end. New York as a city adds to the whole marathon. A marathon and holiday. The time a year, you can find plenty of half marathons, 10k and 5ks as the fall has plenty of these in the "buildup"
The rough course (but problem can be "eased" with proper training!"). Must add 5-10 minutes to finishing time. The entry difficulties, with lottery (100.000 applied in 07) /or qualification times (sub 3 for men). 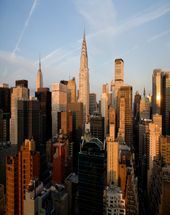 Costs of New York accommodation,hotels. All this is explained below.
" Training for New York, is training with hills added in there!" New : If you are planning to run the New York City Marathon you want a good schedule to take care of your needs and built you strong enough to deal with the hills. After working the 100 Day Marathon Plan this will be a breeze! 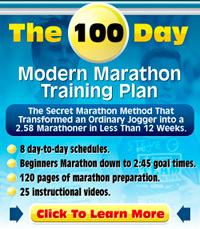 The marathon training scedules in the "The 100 Day Marathon Training !" Information about training for New York Marathon can be also found in the article specifically written here, New York City Marathon Training If you click and read this article, you'll find what aspects are in particular important when training for the New York Marathon. Throw in some hill work after some hard workouts. Learn perfect pace judgment, treadmill if you must. One of the main things in the preparation is to follow a marathon training schedule, program, that takes into consideration the hills and special demands of New York. so that you have good marathon pace judgment before entering. As the course is tough, you will need that extra energy as you approach the finishing part. So how fast can I go on this course ? The New York results 2005-2008 says that you should add some minutes to your finishing time. The New York City Marathon has always been very competitive. As you will see, running the NYC marathon makes you want to add about 5-10 minutes to your time in marathons like Berlin marathon or Paris marathon. This is important, as you plan your training for New York. The course is quite rough and as a runner you have to be smart in your training regime. New York City Marathon Registration - the Application and Entry. Lottery Based or Qualifying Times. Lottery. Or you have to enter the lottery together with the rest. For men, the automatic time was 2:55 for the 2007 race and women 3:23 (a bit slower if you are a master/veteran runner). for internationals you have to enter through a certified New York Marathon travel agency. In 2007, a total of 103.000 people applied for a spot in the race. This is the official page (linking out) for registration/qualifying information for the 2008 race : click here. "Add the New York experience to the Marathon experience"
The marathon is run in November, a beautiful time of year for New York; all the colors of fall - Central Park practically looks alit with a blaze of fire as all the leaves change to red, orange, yellow, and brown. It is said that New York is the city that never sleeps, and it is quite true. And, no matter your interests, you can probably find them here. You have excellent restaurants, and plenty of shopping opportunities. Hotels to stay in for New York, should ideally be close to the subway system. This is much more important than a location "as close as possible to the starting line". When so many people, runners and other enter the city ; this is the easiest way to get around. Good luck with planning your New York marathon running experience. 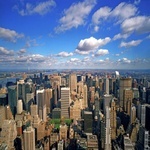 Right below you can share your New York experience or read what others have said before you. Your New York Marathon Review ! Have You Run The New York Marathon Before ? We would love to hear your opinion on it..
How was your experience, did you like the course, anything to be aware of ? How did you prepare for the day,what training did you do and how did you finish ? Do you have a picture from the New York Marathon to add? Great! Click the button and find it on your computer. Then select it. New York City Marathon Training - Take care of the special uphill's ! Thoughts on what to remember in the training for the New York Marathon.